"Feynman diagrams are used to describe the interactions between electrons and positrons. The interactions of electrons and positrons can resulting in absorbing a photon, emitting a photon, or a electron being annihilated by a positron." "Lines in these diagrams represent particles. Every particle has to meet at an intersection that is called an interaction. You can't have a vertex with only squiggly lines (photons) with no particle lines flowing into or out from it." "Feynman diagrams are how we can visualize particle physics, specifically the interactions of electrons, positrons, and photons. We read the diagrams left-to-right, as they are a representation of what happens over a certain amount of time." "The Feynman diagrams are meant to indicate the path that the particles take through space. We interpret the x-axis as the direction of time and the y-axis as the space direction." "A left-to-right arrow is an electron, the opposite is a positron and a wiggly line is a photon. the rest is very vague and I need more explanations on various cases and what they mean." "Positrons point to the left, electrons point to the right. Gamma (squiggly line) are photons. A Feynman diagram should only contain connected pieces, and any diagram with arrows going into a gamma needs arrows coming out or else it isn't an accurate diagram." "Honestly, there wasn't much I understood." "Everything. I don't get Feynman diagrams." 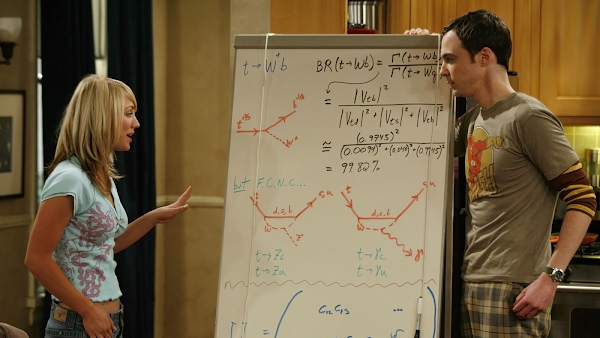 "Why do we use Feynman diagrams? They just seem like squiggles a 3 year-old could draw, why is there not another way to represent these forces interacting?" "Is an electron moving in the opposite direction a positron? What actually is a positron?" "Specifically how the diagrams are to be used." "I don't think I would really be able to interpret them on my own. It would be helpful to do this in class." "This is all pretty trippy. I want to learn more about what diagrams are possible and which are not." "Electrons point right and positrons point to the left." "A position is indicated as e+ therefore, the electron will always be drawn traveling from right to left. Meanwhile, an electron is indicated by an e- and will always be drawn traveling left to right. This way, when they are being read, we can see that the arrows are point in the direction of the flow of electron charge." "Positrons (antimatter) point to the left, electrons point to the right." Describe what will happen if an electron meets a positron. "They will cancel each other out and create pure energy." "They make a big bang!" "It becomes something else (the other symbol thing)?" Explain why the above Feynman diagram is invalid. "Two arrows are going into the vertex. One needs to be going out." "The two electrons cannot intersect at the same point how this one is depicted." "The two electrons cannot crash like that." "What are all these squiggles and arrows about?" "A very basic lecture on what every symbol is called and what happens when they mix would be of great benefit." (D) fully extend its solar panels. Astronomy current events question: "Ultima Thule"
(C) "King Thule's Last Voyage." (D) "Beyond the Northernmost Island." (E) "Ancient Forest of Darkness." Astronomy midterm question: possible IAU classification of re-located Ida? 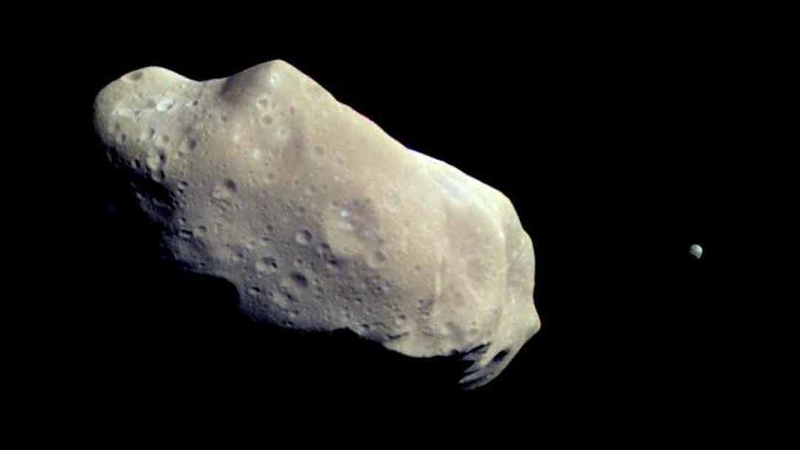 "Ida and Dactyl in Enhanced Color"
If Ida is relocated from the asteroid belt to its own orbit around the sun (while still being orbited by Dactyl), discuss how Ida should be classified. 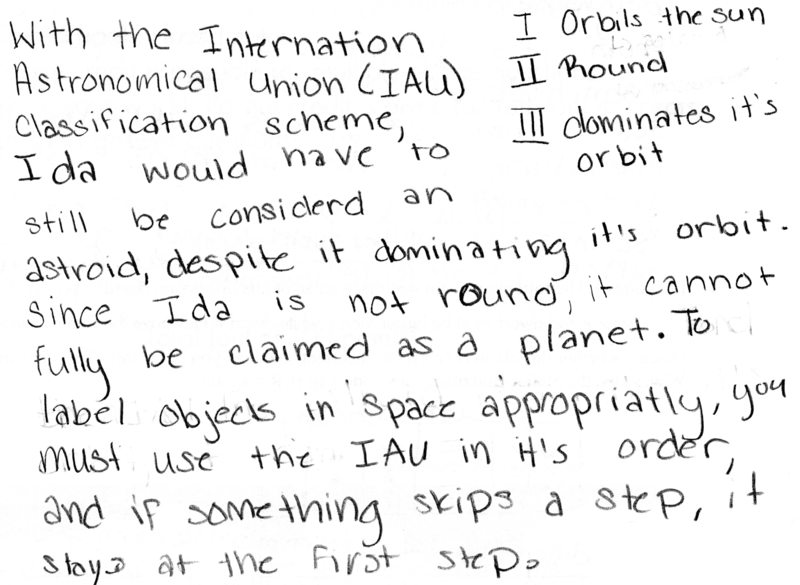 Explain using the International Astronomical Union classification scheme. [*] Matthew Francis, "Moonday: A Bite-Sized Moon," galileospendulum.org/2012/03/05/moonday-a-bite-sized-moon/. Correct. 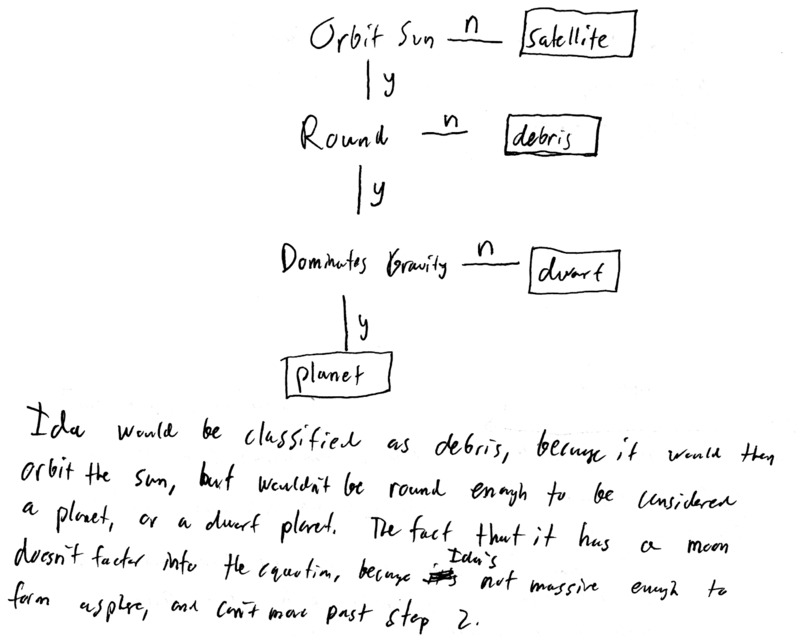 Discusses IAU classification scheme to argue that Ida placed in a new, unshared orbit around the sun would pass qualification I (orbits the sun directly), but would still not pass qualification II (rounded shape), thus categorizing it as solar system debris, despite having its moon Dactyl. Astronomy midterm question: absolute magnitude of "Scholz's star?" 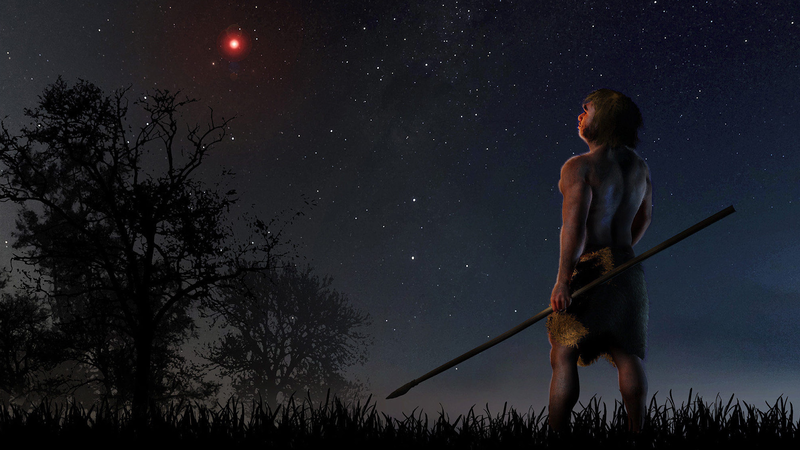 "Scholz's star" (official name WISE J072003.20-084651.2) is a red dwarf that passed very close to our solar system 70,000 years ago[*]. At its closest distance of 0.25 parsecs, if "Scholz's star" had an apparent magnitude of +6 (just barely visible to the naked eye), would its absolute magnitude be a positive number that is smaller or bigger than +6? 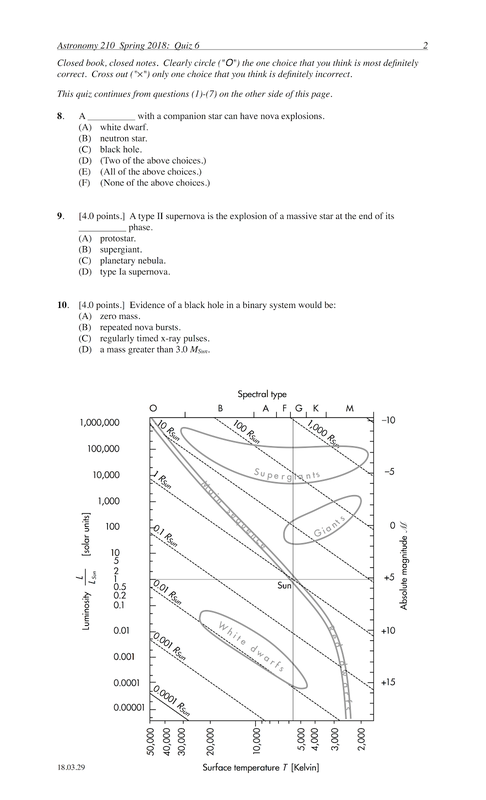 Explain using the relationships between apparent magnitude, absolute magnitude, and distance. [*] E.E. Mamajek, S.A. Barenfeld, V.D. Ivanov, A.Y. Kniazev, P. Vaisanen, Y. Beletsky, and H.M.J. Boffin, "The Closest Known Flyby of a Star to the Solar System," Astrophysical Journal Letters, vol. 800 no. 1 (2015), iopscience.iop.org/article/10.1088/2041-8205/800/1/L17/pdf. Correct. Understands difference between apparent magnitude m (brightness as seen from Earth, while at its actual distance from Earth) and absolute magnitude M (brightness as seen from Earth, when placed at the "fair comparison distance" of 10 parsecs away). Discusses how this star with an apparent magnitude value of +6 (measured at 0.25 parsecs) will seem to get dimmer when placed farther away at 10 parsecs, such that its absolute magnitude will be dimmer than its apparent magnitude, and thus a positive number bigger than +6. Astronomy midterm question: red dwarf larger than a white dwarf with same luminosity? csmo: A red dwarf must be larger than a white dwarf if they have the same luminosity. Correct. From Wien's law, determines red dwarfs are cooler than white dwarfs, and uses the Stefan-Boltzmann law and/or interprets H-R diagram to demonstrate that in order for red dwarfs and white dwarfs to have the same luminosity, the cooler red dwarf must be larger in size than the hotter white dwarf. 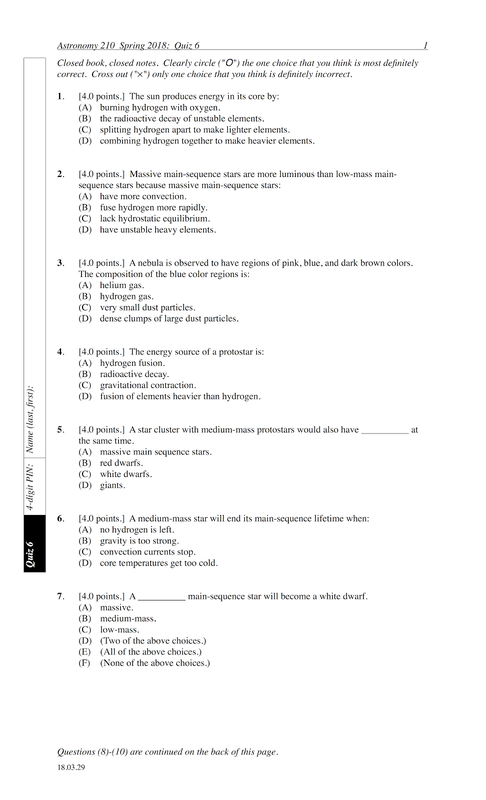 The following questions were asked on reading textbook chapters and previewing presentations on radioactive decay modes. "The atomic number represents the total amount of protons. The nucleon number represents the combined number of protons and neutrons. The number of neutrons can be determined by having the nucleon number minus the atomic number." "The different decays all achieve stability through different means. Some expel particles while other transform particles into other ones." "The key to stability is being able to keep the protons in the nucleus together. Alpha decay is how a nucleus with excess protons achieves a more stable configuration. Beta-minus decay is how a nucleus with excess neutrons achieves a more stable configuration. Beta-plus decay is how a nucleus that is neutron deficient achieves a more stable configuration. Gamma decay is how a nucleus achieves a more stable configuration, but not because it has too many protons, or the wrong ratio of protons to neutrons." "For all atomic nuclei the key to stability is being able to keep the protons in the nucleus together. Also, having a certain number of neutrons in the nucleus will decrease the proton-proton repulsion." "For all atomic nuclei, to have stability they have to keep the protons in the nucleus together, in spite of them all repelling each other. They need to have the proper ratio of neutrons, approximately equal to or slightly greater than the number of protons. More than 83 protons would automatically make the nucleus unstable." "Stability conditions. A nucleus with more than 83 protons will always be unstable. Neutrons help to balance out proton to proton repulsion so it's necessary to have more neutrons than protons in a nucleus in order to be stabilized. The different decay processes we are learning about are used by nuclei to help them reach stable conditions depending on what makes them unstable to begin with." "Radioactive decay occurs in four ways. If a nucleus has more than 83 protons, it will emit He to decrease p and n equally (alpha particles). If protons are significantly less than neutrons, neutrons will be converted to protons, releasing antineutrinos and electrons (Β– particles). If protons are more numerous than neutrons, protons will be converted to neutrons, releasing positrons (Β+ particles) and neutrinos. Nuclei become excited after decay and will release photons to 'calm down' (gamma particles)." "This is pretty basic chemistry stuff, it doesn't seem to be a problem." "The different types of decay--from a problem-solving perspective it would just be nice to see some different examples going through how to sort each type of decay." "Most of this was a good refresher on decay and specifically all of the types of it that I learned in the tail-end of my general chemistry series last year." "I don't understand the difference between a nucleus that is stable or unstable." "Electron capture and the 'swallowing' thing. And also a bit of gamma decay." "I am having a harder time with gamma (γ) decay. I will do more research to clarify the topic but for right now I'm not grasping it." "I feel like electron capture was passed over too quickly, I don't really understand what happens." "What is a neutrino and can it be positive or negative?" "Outside of confusing the different decay processes this is thankfully review from other classes. " Explain what a "nucleon number" is, and/or describe how to calculate it for a nucleus. "It is the total number of protons and neutrons inside the atomic nucleus." "The nucleon number is the total number of nucleons (protons and electrons), such that the number of neutrons is the difference between the nucleon number and atomic number." Identify the processes that increase, decrease, or do not change the number of protons in the nucleus. Identify the processes that increase, decrease, or do not change the number of neutrons in the nucleus. Identify the processes that change a proton to a neutron, or change a neutron to a proton in the nucleus. "Quiz 6 is going to be awful...I have such a hard time with the right-hand rules and flux laws." "This seems like it is going to be the most interesting section to date!" "I think I'll like this chapter a lot better than the previous ones!" "Could we go over electron capture?" or to two significant figures, the half-life of this sample is 30 years. 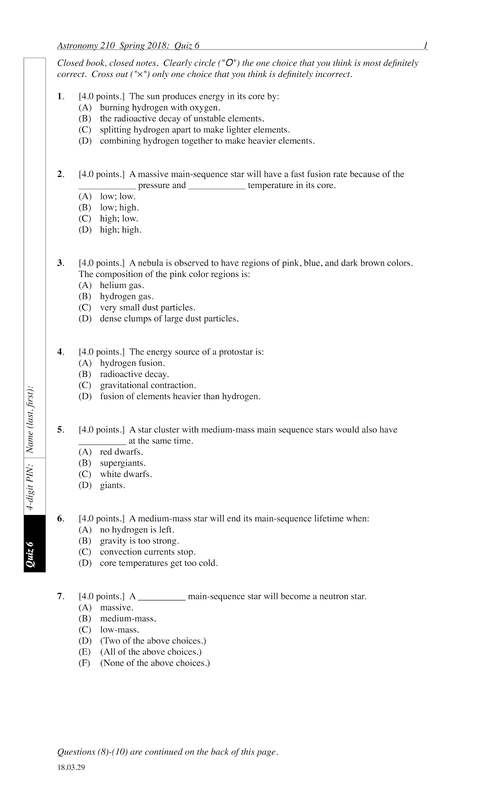 The following questions were asked on reading textbook chapters and previewing presentations on radioactive decay rates. "Exponential and half life decay are both covered well in general chemistry so it's somewhat of a review. But the M&Ms® example is still helpful." "I understood the introduction to radioactive decay and half-lives. I feel like most of this is from previous biology and chemistry classes." "Thankfully, this presentation was a bit of a refresher from my other physical science classes. Radioactive dating helps us determine how long the radioactive substance has been around, assuming that there are no daughter atoms to begin with." "I understand that older substances have more daughter atoms in them. Different elements have different half-lives." "When there are more daughter atoms the sample is older. The daughter are released when the sample that is being melted, which will then determine the age of the material/sample." "Radioactive decay can be used to determine the age of an unknown material. This is done using half-lives to measure the time these radioactive materials decay in the unknown material." "Gaseous daughter atoms can be compared to the amount of radioactive atoms left in a sample to determine how long ago the sample started. After a molten sample solidifies, it will start anew with having radioactive atoms with no daughter atoms." "I actually feel okay with this stuff thanks to chemistry and other classes I've taken that have dealt with radioactive decay. Going through the slides one more time will help me understand things more." "There wasn't anything too confusing from the presentation preview. I have learned about radioactive decay in other classes before." "I don't understand the equation for half-life decay, or radioactive dating." "I would like to go over problems to get more familiar with the equations." "I'm confused with the section on radioactive dating, or carbon dating. How exactly is the age of something determined?" "I don't understand the process to calculate the half life of a material or why melting an object affects its half-life." "How is the clock reset when matter is solidified after melting if gaseous daughter particles escape?" "I am struggling with the melting and solidification ages." "At the moment I am not sure what I find confusing. Most of the lecture made sense to me as far as I am concerned." State the SI units for activity (radioactive decays per time). For a radioactive decay process, the time constant τ ("average lifetime") is __________ half-life T1/2. Two samples are each comprised of 800 unstable atoms that will undergo radioactive decay. The remainder of one sample is 200 inert, stable atoms not involved in a radioactive decay process. The remainder of the other sample is 200 daughter atoms of the radioactive decay process. Describe what changes in a sample when it melted and then solidified that resets its solidification age as determined by radioactive dating. "Daughter atoms are released and are compared to the radioactive atoms that are left in the sample. Melting it resets its solidification age." "Since daughter atoms (which are used to date the substance) are gaseous, when the substance is melted they are released. Therefore, they are no longer in the substance effectively resetting the age of the substance." "There are technically no radioactive atoms or daughter atoms in the sample anymore, so it can reset its solidification age." "Gaseous daughter atoms are released. This tells us how long ago the sample started with radioactive atoms with no daughter atoms." "When a substance is liquified the once solidified daughter atoms are released into the air. When the substance is allowed to cool back into a solid the daughter atoms to not solidify back into the original state. This makes its a less reliable in radioactive dating." "I really still think I need help with Lenz's law and Faraday's law." "The semester after spring break is harder than I thought. But I think I will be able to catch up for the final." "I need to play Half-Life again." NASA's Kepler space telescope's observations of Fast-Evolving Luminous Transient (FELT) explosions may be explained by stars that expel __________ before becoming supernovae. A star cluster with medium-mass protostars would also have __________ at the same time. (A) massive main sequence stars. All stars in a star cluster are born at the same time, but undergo stellar evolution at different rates depending on their masses. Medium-mass stars start out as protostars, then reach their main sequence stage, and subsequently become giants, planetary nebulae, and then white dwarfs. So a star cluster with medium-mass protostars cannot have giants nor white dwarfs at the same time, as these are stages that follow the protostar stage of a medium-mass star. A red dwarf is a low-mass star that has evolved from its protostar stage to its main sequence stage; this takes much longer for a medium-mass star to evolve from its protostar stage to its main sequence lifetime. So a star cluster with medium-mass main sequence stars cannot have red dwarfs at the same time. A massive star will evolve from its protostar stage to its main sequence stage at a rate much rapidly than medium-mass stars. Thus it is plausible that a star cluster with medium-mass protostars can have massive main sequence stars at the same time. A star cluster with medium-mass main sequence stars would also have __________ at the same time. All stars in a star cluster are born at the same time, but undergo stellar evolution at different rates depending on their masses. Medium-mass stars start out as protostars, then reach their main sequence stage, and subsequently become giants, planetary nebulae, and then white dwarfs. So a star cluster with medium-mass main sequence stars cannot have giants nor white dwarfs at the same time, as these are stages that follow the main sequence lifetime of a medium-mass star. A supergiant is a massive star that has evolved from its protostar stage to its main sequence stage, and subsequently used up all of its core hydrogen exit its main sequence stage. Since massive stars evolve much more rapidly than medium-mass stars, then it is plausible that a star cluster with medium-mass main sequence stars can have supergiants at the same time. "It's pretty crazy to think we don't know what our galaxy looks like for sure." "That we are able to observe that our galaxy has a disk shape even though we cannot get a real image of what it is like from an outside point of view." "The fact that the entire galaxy is not made up of stars. and that the stars we do see is only apart of the milky way galaxy." "The spiral arms--I think galaxies are so unique and colorful, learning more about the shapes interests me." "How we are able to perceive our position in the Milk Way by observing star clusters above and below us." "Dark matter--that we're able to observe galaxies and deduce their gravitational patterns without really understanding where it comes from or being able to quantify those characteristics." "The description of dark matter was both interesting and confusing, because why does dark matter effect nothing on the outside of the halo? Why does it occur in a perfect sphere if there are multiple sources?" "The analogy where we looked at dark matter in the terms of a criminal at large. It really makes sense to have its existence put in terms of this situation. I really liked the phrase 'though the case may never be definitively solved, doesn't mean that this person (dark matter) doesn't exist.' Why is this interesting to me personally? I think any time information that is confusing to me can be put into some type of cool analogy I am set." "Dark matter, despite the fact that we do not know much about it." "Dark matter is really interesting. I think just for the simple fact that we don't fully understand it, I am intrigued by it." "Dark matter, because I didn't know it made up the majority of the Milky Way." "Density waves interest me but also very much confuse me!? I really like the fact it helps make our beautiful galaxy even more so. I also think it's badass that our galaxy gets its spiral arms from swallowing others!" "Density waves and how they are caused! Gravitational interactions from the collision of thin disk galaxies (with no spiral arms) pulling in dwarf galaxies causing 'ripples' that form density waves." "I have no doubt that there were many things that would have been interesting." "All I know is that I want PimpStar Rims on my car. It would be so cool. "I'm confused about all the information that we can find in the H-R diagram. I can't keep track of it." "The section on globular clusters and cepheid variables is super-confusing. I don't really understand how those things work at all, honestly." "Dark matter, because it's cool and strange." "Dark Matter. How the heck does that stuff work?" "Dark matter...all I know is that there is not much to learn since not much is known of it in the first place." "How is the spinning of the Milky Way related to the way light-up rims spin on car tires?" "How Milky Way spiral arms can grow back such as the legs of sea stars." "Density waves! What kind of time frame are we talking about with these stars living and dying? How solid is the evidence we have and how can we improve from what we have already? What's the next evolution is solidfying or discovering more solid information about of true shape and size?" "I know everything so I'm not confused at all." "Everything is slightly confusing for me until P-dog breaks it down for us in class." "I would look at my reflection from a metal spoon." "A camera! Take a picture and see how it looks!" "Know that I'm gonna have one regardless." "Only leave the tent at night so nobody can tell." "Assume it's bad and put a hat on." "I'd leave it, lol it's just camping. I don't think the birds, bears, and deer are going to care too much over a few fly away hairs." "Ask a friend/fellow camper to describe to you the state of your hair to you." "You could feel with your hands to see if any hair is going in any crazy directions." "They hook up lights to your rims that light up with your car." "The images are created using a strobe modulation technique. LED lights are timed to light up at certain points in a full rotation so that, to the naked eye, a still image is created with multiple flashing images." "As the wheel is spinning the individual lights are programmed to blink at a certain time and gives the viewer an image. If the wheels were not spinning and the lights still blinked the same you wouldn't see an image." "The lights that flash are timed and synced up to the speed that the wheel goes in order to light up at the correct time making really cool patterns and light combos on the face of the wheel." "It has to do with lag and certain timing of when lights need to flash or not flash." "Persistence of vision: flickering lights plus motion/movement." I liked the spinning light-up rims analogy." "What do the light-up wheels have to do with us learning about the Milky Way?" "I have two exams before tomorrow's quiz, so other than quiz prep, I haven't had much time to focus on the new material. I'll get to read tomorrow!" "I have been watching a lot of slime videos and all of the galaxy pictures look like slime I could make." "I am beginning to understand generators better now, and better understand how moving a magnet creates energy than when I did the last reading assignment." "The magnetic flux ΦB is the product of the magnetic field magnitude B and the area A. The maximum magnetic flux occurs if the magnetic field is perpendicular to the surface." "Magnetic flux is an area multiplied by a magnetic field. Faraday's law says that an induced emf occurs in a wire loop when the magnetic flux through it changes." 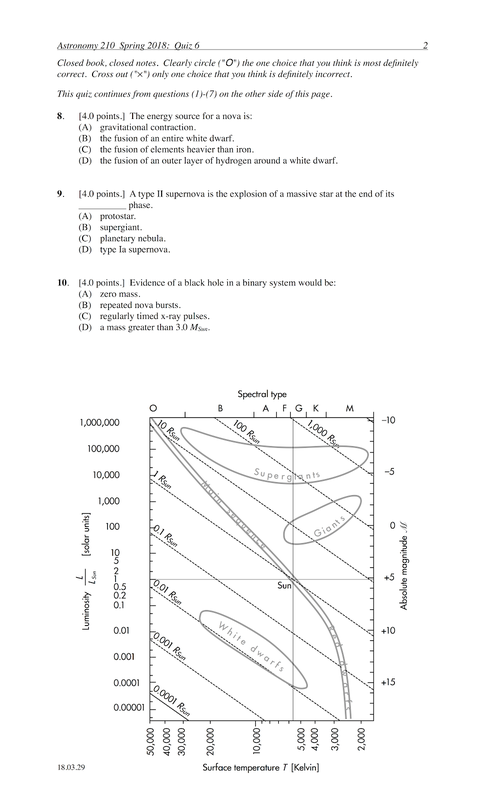 "Magnetic flux ΦB is the product of the magnetic field magnitude B and the area A. Units of T·m2 or webers." "Induced current opposes ΦB change." "Induced emf, which is produced by changing magnetic flux." "The slide-rail generator and Faraday's law. The faster the rod moves, the more area there is, thus more emf is produced. In addition, if magnetic flux is constant, an emf can not be produced." "Faraday's law states that an induced emf in a wire loop occurs while the magnetic flux through it changes. If flux is constant there is no emf. Induced current always opposes the magnetic flux. Differing primary and secondary coil turns allow emf to be stepped up or down." "How transformers work to step up or down the voltage from the primary loop to the secondary loop." "I'm not sure I really understand any of this lesson." "The slide-rail generator--how the force generated on charges through the rod makes the ends charged." "I'd like clarification on what magnetic flux is, I'm still confused by it after reading the examples." "How magnetic flux works with the induced current." "How and when to apply Lenz's law." "I am confused in the situational uses of these equations. More in-class assistance and instruction would be helpful." "I found the section on transformers pretty confusing. Also the step-down vs. step-up stuff didn't make a lot of sense to me." "A little bit of everything is confusing. I just need to make the connections between the different piece...Lenz's law is not yet understood." "I definitely need a lot of explaining on this stuff I cannot grasp the concepts from just reading the lectures online." "What is Lenz's law? I don't know what is used for and what context it is useful. Really some explanation for me here would go a long way." "How to incorporate RHR3 to Lenz's law." "I'm pretty confused about most of this lesson." The symbol looks like a circle with a vertical line through it and it is the product of a magnetic field and an area." "There would be no change in emf as the ratio of N2 to N1 would be 1." "The transformer would not be able to regulate voltage to step it up or down. The primary coil and secondary coil turns cannot be the same amount." "The whole point is that they have a different number of turns in order for voltages to be stepped up or down." "Because nothing is being transformed." "Following this pace is getting hard." "Please go over these examples I am very lost on this subject!" "I enjoyed learning about the Milky Way. I thought it was interesting to see how large it is compared to everything else, which blows my mind." "The Milky Way, considering I can see it at my house, so learning about it will be interesting." "That even though we are in the Milky Way, we can still tell what size and shape it is by using different methods." "The fog model because it explains why we can only see part of our Milky Way and not the whole thing, and it is one of the easier models to understand." "That all the stars in our galaxy are actually in their own orbit, they're not static in their position in space. As Earth moves around the sun, the sun is moving in its own orbit around the Milky Way." "The formation theroies, because they started to give me a sort of eye-opening experience as to crazy is was that the Milky Way Galaxy had been created and how everything had fallen into place to create the galaxy, let alone create life on Earth." "Okay, this is going to sound dumb, but since we have been studying spiral and elliptical galaxies, it just hit me hard that we are in a spiral one. We are in between the Sagittarius and Perseus Arms! Like I knew the Milky Way was spiral, but I now I'm looking at it and it's crazy that life exists in these things." "Without being able to see the entire Milky Way, how are we able to ascertain its shape and look?" "Globular clusters--it's weird how they can determine how far we are from the center of the Milky Way." "Dark matter is confusing, because what is it?" "The density waves were a little confusing for me, and also the radio wave/far-IR maps of the Milky Way." "I found the spiral arms and spurs to be confusing, what are they made of? Just living and dying stars?" "How stars form inside of the spiral arms. It says that they form inside gas, but where does the gas come from? Does it come from stars that have died?" "That spiral arms are just an illusion? Density waves? Why does it have to be like this?" "Use your phone, you don't even have to turn it on--if you get it in the right light you can see your reflection." "Use the back of a metal spoon or any shiny metal object if you camp that way." "Fill a pot or bucket with water, set it on the ground and let the water get still, then look!" "Reflection off a car window." "Look at the reflection in a river or body of water." "The facial expressions of the people I am with." "Ask a fellow camper. 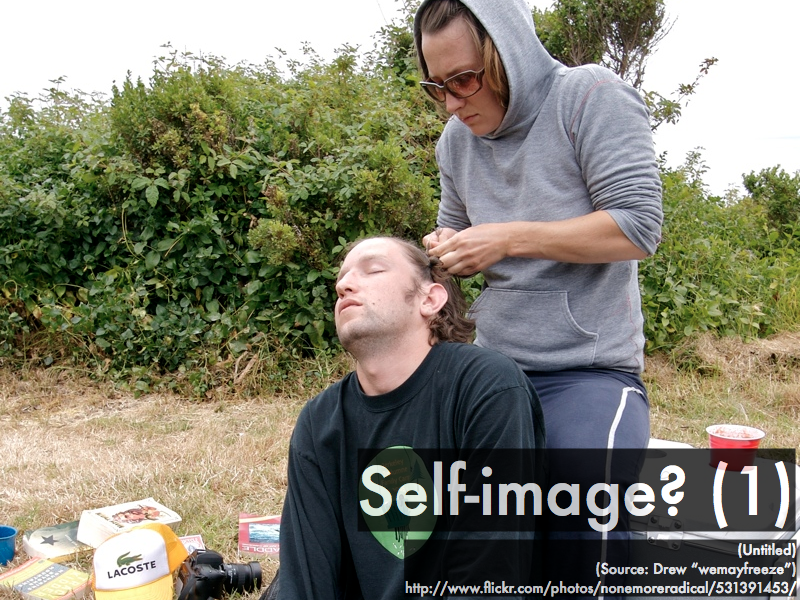 Or don't bother, since we are camping, odds are that other campers are having just as much of a bad hair day as me." "Look at your shadow to see an outline of your hair to see if its frizzy or not." "The wheels have built in LEDs that flash or strobe at a certain speed, matching the speed of the wheel, to create the illusion of a still image." "They are basically led lights hooked up to your rims and use wifi to display whatever image you choose to show while your wheels are spinning." "A strip of lights cause the illusion of the entire wheel to light up when moving--you know, technology." "I love camping...in a trailer."